Could the photovoltaic cell replace the Holstein cow as an iconic symbol of Vermont? Solar farms are sprouting along many of the state's roads, while additional large-scale installations are arising more discreetly behind visual barriers. Thousands of homes and businesses now have arrays of solar panels affixed to their roofs or tucked into back lots. Green Mountain Power, the state's largest utility, is hyping its grand plan to make Rutland "the solar capital of New England." It's suddenly hip to draw energy from the sun in one of the coldest and cloudiest states in the country. Evidence of this solar flare isn't just anecdotal. According to the Washington, D.C.-based Solar Energy Industries Association, electrical output from residential and commercial solar installations grew last year in Vermont by 35 percent, bringing total energy generation from our nearest star to 39 megawatts. That's enough electricity to power 6,700 homes. In 2013 the state hosted more than 45 solar-related companies that together employed some 1,300 Vermonters, according to the association. That gives Vermont more solar industry jobs per capita than any other state in the nation. As a result of the increasing reliance on sunshine and other clean sources of electrical power, the state has made a start toward its ambitious goal of obtaining 90 percent of its energy from renewable resources by 2050. In addition, money that would otherwise flow elsewhere is being recycled at home as thousands of Vermonters become more energy self-sufficient and rely less on power purchased from out-of-state plants. 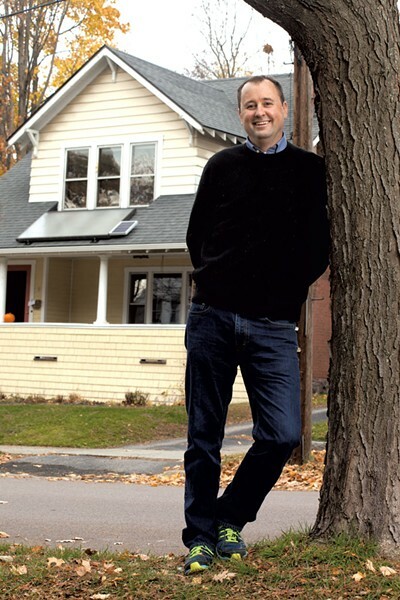 "Renewables will save Vermonters hundreds of millions of dollars," predicts Duane Peterson, copresident of SunCommon, the state's largest residential solar company. "It's kind of insane," he adds, that the dirtiest, most expensive types of energy — gasoline, coal, fuel oil and natural gas — currently account for two-thirds of the power Vermont consumes. The turn toward the sunny side has been fueled in large part by economics. Uncle Sam is offering a tax credit worth 30 percent of the cost of buying and installing a solar system. And the state gives a rebate of 25 cents per watt derived from a new solar electric installation. For the typical customer, according to Peterson, that amounts to around $1,750. Additional breaks are available to those who buy solar hot-water units. With a $1,000 rebate from the state, $1,600 from Efficiency Vermont and federal tax credits, the cost of a typical unit drops from $9,500 to about $5,000, notes Tom Hughes, CEO of Sunward Systems. The Shelburne-based firm specializes in helping homeowners take hot showers courtesy of Old Sol. But a few storm clouds threaten what might look like a blindingly bright future for solar in Vermont. The big subsidy — that 30 percent federal tax credit — will be sharply reduced in two years. And the state's 25-cents-a-watt incentive will soon expire altogether. Meanwhile, some renewable-energy facilities have started to encounter local resistance. Legislators gave the state's Public Service Board sole oversight of siting solar clusters, in order to streamline the permit process. A few towns are now protesting these projects' exemptions from local land-use reviews and are calling for a meaningful role in vetting them. Sun power may actually be nearing the same "inflection point" that wind power has reached in Vermont, suggests Rod Viens, vice president of groSolar, a national design-and-build firm based in White River Junction. In the swelling chorus of complaints about "Big Solar," Viens and others hear echoes of the outcry against "industrial wind." But most solar installations in Vermont are "completely noncontroversial," Hughes says. Unlike ridgeline wind turbines, which are visible for miles, rooftop or backyard solar arrays are low profile — literally and figuratively. Vermont's solar sector also rests on a firm foundation: the net-metering program that the legislature put in place 17 years ago. Net metering enables users of renewable energy to get credit for the excess power their systems contribute to the state's electrical grid. Solar currently accounts for more than 90 percent of the energy homes and businesses are selling back to utilities. "On the longer, sunny days of summer, the power generated by solar panels pours off our customers' roofs, past their utility meters and into the grid," Peterson of SunCommon explains in an email. "Solar homes run up huge credits by the end of the summer." At night and on the shorter, darker days of winter, solar users draw juice from the utilities' systems, but some sun-powered homes produce so much surplus power that "they net out at zero, paying the utilities nothing," Peterson notes. That helps offset the cost of installing a solar array for energy consumers. Instead of writing a monthly check for $50 or more to Green Mountain Power, a net-zero household can use that sum to pay down a loan that financed a solar system. This arrangement also obviates the need for an expensive solar-energy storage unit because the electrical grid performs the same function as a large set of batteries. Net metering has been "incredibly successful" in spurring a switchover to solar, says Dylan Zwicky, clean-energy associate with the Vermont Public Interest Research Group. The legislature has further goosed the transition to solar by raising the cap on the share of utilities' generating capacity that can be sourced from net metering. Formerly, utilities could turn off the net-metering flow of power into their systems when it amounted to 4 percent of peak capacity. The threshold was raised to 15 percent earlier this year, meaning that many more homes and companies with smallish solar arrays — 500 kilowatts or less — can now take advantage of the opportunity net metering offers. The fix was necessary because a few small Vermont utilities had already hit the 4 percent cap under previous regulations — a testament to the popularity of the program. "Vermont isn't Phoenix or Spain, but it still gets a good amount of sunshine," Hughes of Sunward Systems notes. In fact, adds Peterson, "even as far north as Vermont sits on the planet, we here get 83 percent of the sunshine as does Miami, Fla."
Darkness descends on some solar developers when they contemplate the disappearance next month of the state's 25-cent subsidy and the scheduled reduction of the federal tax credit from 30 to 10 percent at the end of 2016. It's even possible that the Republican-controlled Congress will seek to scrap entirely what some of its members view as a handout to hippies. But on the other hand, Hughes observes, "Republicans like job creators, so they might restore a tax credit that accounts for a lot of jobs." On another emerging battlefront, right-wing forces are attacking the net-metering program in selected red states. The Koch brothers, anti-tax activists, a few of the largest power companies in the U.S. and a coalition of conservative state legislators argue that net metering privileges households using renewable energy because they tap into the electric grid when needed but pay little or nothing to maintain it. Clean energy's defenders say in response that net metering provides benefits to regional power pools sufficient to offset the cost of net metering. While it's unlikely the Koch brothers will be bringing their anti-solar campaign to Vermont, the state should not be content to bask in its achievements and its pro-solar policies, some industry figures say. "Vermont does far less than many states in promoting solar," says Andrew Savage, spokesman for AllEarth Renewables, a Williston-based designer and builder of solar systems. New York, for example, offers a 25 percent state tax credit for installing a residential system. "I'd definitely like to see Vermont bring in a state tax credit," says Tom Champlin, senior solar consultant for Real Good Solar Energy in Montpelier. The state actually did offer a 30 percent tax credit for solar development some years ago, but it was withdrawn due to fears that it would bankrupt a Clean Energy Development Fund established by the state in 2005. That pot of money had been used to underwrite more than $35 million worth of small-scale, renewable-energy projects — about half of them solar — during the past eight years. It's financed mainly by payments from Entergy, owner of the Vermont Yankee nuclear plant. The state also promotes solar through its standard-offer program: Solar developers can get long-term contracts at guaranteed rates calculated to ensure they will recoup their initial investments and cover their operating costs. Vermont Electric Power Producers, the purchasing agent for Vermont's 17 utilities, is obligated to buy the energy they generate. Joe Larkin and his partners are developing a large solar array in South Burlington. They're guaranteed to receive slightly more than 27 cents per kilowatt hour powered by their project for each of the next 25 years. That rate is currently much higher than what it costs to produce non-renewable power, but a steep inflation rate could eat away at the standard-offer price. "Time will tell if it's a good deal," Larkin says. Vermont's solar industry no longer needs the state's watt-based subsidies, says Public Service Commissioner Chris Recchia. Today's 25-cent payout had initially been set at $2.50 a decade ago and was structured to dwindle down to nothing by the end of 2014, Recchia notes. 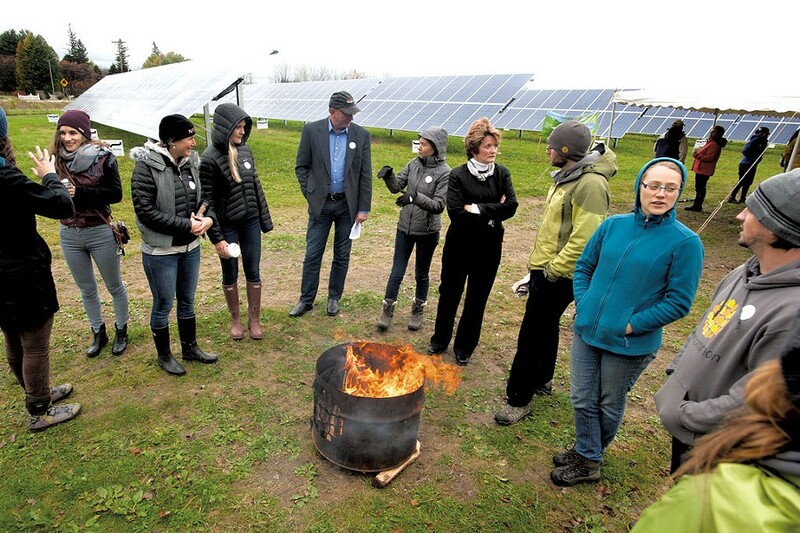 "Solar has grown exponentially in Vermont even as the incentive decreased," he observes. "We've supported the industry when it needed support, and we don't think that support is needed any longer." A few solar developers suggest that the industry may no longer need federal financial support, either. Peterson says the time is approaching when solar should stand on its own — even though government subsidies for exploitation of dirty energy such as oil and coal are provided, he says, "in perpetuity." The decreasing cost of solar technology may compensate for reductions in federal subsidies, hypothesizes Viens of groSolar. The price tag for buying and installing a residential system shrank by 8 percent last year alone, according to an industry association. That brought the total decline in price since 2010 to about 40 percent. And there's no reason to think technological advances won't continue to enhance efficiency, making solar steadily more affordable. But some industry officials do expect the rate of expansion to slow once the reduction in the federal tax credit takes effect. The 30 percent write-off remains "critically important" to the growth of Vermont's solar sector, says Savage of AllEarth Renewables. More effective marketing techniques may help the solar sector find larger numbers of customers in the coming years. SunCommon, for example, uses a community-organizing model to identify prospects in each of Vermont's counties. Drawing on the VPIRG background of cofounders Peterson and James Moore, SunCommon sends recruiters into the field to solicit business by apprising local residents of the savings and the fuzzy feelings to be gained from a climate-neutral energy resource. 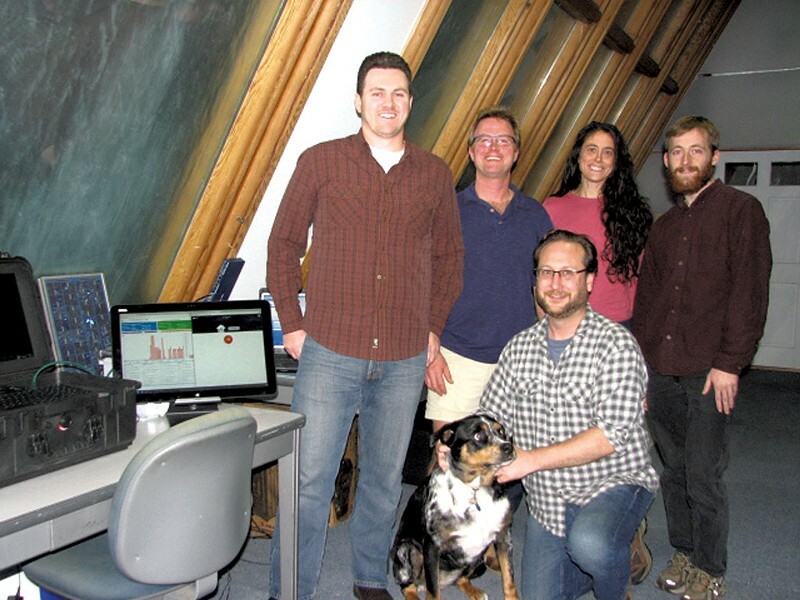 Faraday, a company launched in 2012 by graduates of Middlebury College, recently received a $1 million grant from the U.S. Department of Energy to apply its customer-acquisition software to the solar sector. Named for wonk-revered 19th-century British inventor Michael Faraday, Faraday uses specialized algorithms to comb through data on 100 million American households to find likely buyers of big-ticket items. "Solar installers will spend more than $5,000 acquiring customers for systems that cost $20,000," notes Faraday CEO Andy Rossmeissl. "We can save them a lot of that cost." Will solar likely supplant wind as the hottest commodity in the renewable realm? Clean-energy advocates argue that wind must remain part of the clean-energy mix in Vermont despite intense local opposition to some turbine projects. Wind generates far more energy per unit than does solar, notes Gabrielle Stebbins, director of Renewable Energy Vermont, a trade association. The four wind farms in the state produce about 65 megawatts of electricity, compared to the 50 megawatts turned out by the 25 largest solar arrays, she notes. "We need everything" if the state is to attain its 90 percent renewables objective, Stebbins says. Solar does have a few advantages over wind. For one, photovoltaic cells don't make any noise, notes AJ Rossman, head of Smart Research Labs in Burlington. For another, he adds, sunlight is available everywhere in Vermont, while wind reaches usable velocities only in certain locations, such as ridgelines. Big solar arrays are necessary, however, because about half the homes that SunCommon surveys turn out to be unsuitable candidates for rooftop installations, Peterson notes. "The roofs are shaded by trees or structurally unable to support panels, or the house is facing the wrong way," he says. But commercial solar arrays covering several acres are kicking up plenty of controversy in parts of the state. The South Burlington Planning Commission and the South Burlington Land Trust both objected last year to Larkin's plan to install 366 solar tracking units on a 22-acre field off Hinesburg Road. Larkin made concessions in response to criticisms of the project's aesthetic impact, but the local opposition remained steadfast. The array started producing power in August, however, because it had gained clearance from the Vermont Public Service Board. Larkin spoke to Seven Days at the site, where roughly 25-foot high panels towered in row after row. Occasionally, the units hummed, barely audible, as trackers repositioned them to follow the sun. The site is near the Cider Mill subdivision but otherwise tucked away. "Locals are frozen out of the process," Rutland Town selectboard member Dan Chioffi says in regard to site reviews of renewable energy projects. In response, that board has added a section to the town plan that sets standards for potentially regulating the siting and scope of large-scale solar installations. The move was prompted by local opposition to a proposal by Green Mountain Power and groSolar to install a 2.3-megawatt solar farm on a 15-acre parcel off Cold River Road. The Public Service Board is assessing the project. "We're not against solar," Chioffi says. "But we do think it needs as much review as any other development would get under Act 250." Officials in Shelburne have expressed interest in formulating similar standards due to some residents' worries about the appearance of a proposed solar installation on Route 7 near the Vermont Teddy Bear factory. The New Haven selectboard also recently went on record in opposition to two solar projects proposed for the Addison County town. Objections were based mainly on the anticipated interference with views. The rash of solar projects taking shape in Vermont may come to be seen as rushed initiatives that could result in regrets, says Kathy Barrett, chairwoman of the New Haven selectboard. "The technology is changing quite rapidly," she notes in regard to photovoltaics. By way of analogy, Barrett recalls that TV satellite dishes were originally supersize but became almost pocket-size over time. "Why don't we slow down and wait to see how it evolves?" she suggests. Some state officials and private solar developers acknowledge that siting decisions have not always been made with as much sensitivity to aesthetics as they should have. At the same time, proponents of sun power say better communication with locals can assuage concerns about solar arrays. "There needs to be more education about why these projects are being built," says Stebbins, head of the renewable energy trade association. "Vermonters don't know what's in the state's energy portfolio. When they understand how much we rely on oil and what the benefits are of going with renewables, the conversation starts to shift." Local siting of energy projects is bound to become more common, suggests Mary Powell, CEO of Green Mountain Power. And that's a good thing, she and other energy executives say. "For a long time, our energy was coming to us from far away," observes Zwicky of VPIRG. "It was a case of out of sight, out of mind." It's essential and proper for consumers to take a stake in the production of energy, he says. Public service commissioner Recchia presents a similar view in more emphatic terms: "Everybody in New Haven, they turn their lights on, too." Solar boosters voice confidence that arrays can be hidden from view more effectively. "There's no doubt that solar can be compatible with Vermont's working landscape," says Savage of AllEarth Renewables. Encore Redevelopment is working to achieve that outcome. It designs solar arrays to fit inconspicuously on top of structures such as a parking garage at Burlington International Airport. 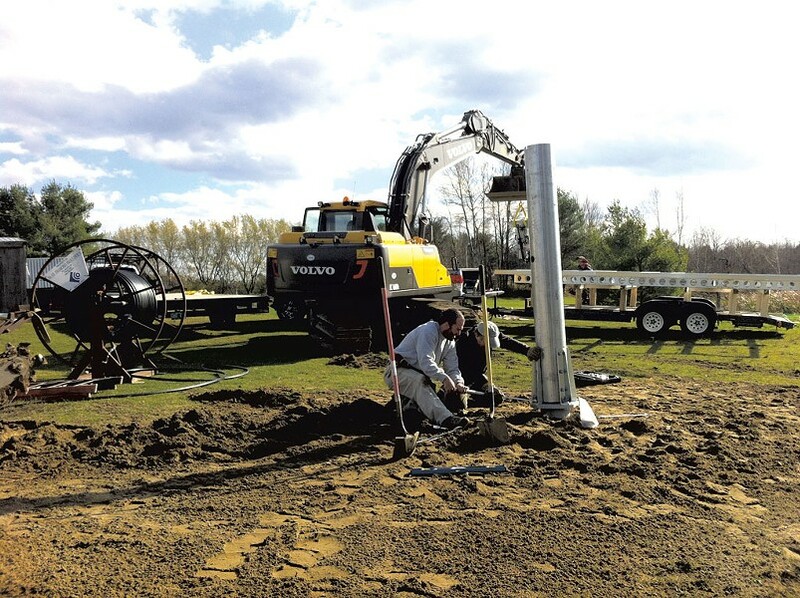 Encore adds screening elements such as "aesthetically pleasing fencing" to shield solar farms from view, says Chad Farrell, owner of the Burlington-based firm. It has likewise sited solar in places that would be unlikely to provoke opposition on aesthetic grounds — in former landfills and brownfields, for example. Farrell counsels solar developers to exercise caution. He says, "It's critical for the industry to recognize that any time you put something in the Vermont landscape, that represents a change, and change can sometimes be hard for folks to accept." Sitting on fresh earth, Darren O'Meara and his father, Pat, braced themselves and cranked hard on a large wrench. At work in the backyard of a Milton home, they were securing a large metal mast that would soon hold an array of solar panels vast enough to power the residence. Nearby, a Volvo excavator hoisted the hydraulic unit that would help the solar tracker follow the sun over the course of a day — maximizing the amount of electricity the array can generate. "This really is the Cadillac of panels," said Pat O'Meara, appreciatively, pausing to wipe the dirt from his hands. Darren O'Meara, 35, wore a light gray crewneck sweatshirt with "IBM" stenciled on it and a tool belt slung around his waist. The semiconductor test engineer is on a part-time leave of absence from his Essex employer — and he hopes, if all goes according to plan, that he'll soon be able to make his fledgling solar installation company a full-time gig. He went into business with his dad, a carpenter, last summer. "With all the downturns and the layoffs, I just started thinking about what else could I be doing," said Darren O'Meara, reflecting on recent tumultuous years at the IBM semiconductor plant. IBM recently struck a deal to sell the plant to GlobalFoundries, which specializes in semiconductor manufacturing; the deal came after IBM cut its Essex workforce over the course of a decade by more than half, to roughly 4,000 positions. So he started looking around — and settled on solar. "We're off-grid ourselves," explained Pat O'Meara. After designing and installing the electrical systems that power their own homes, in East Orange, the father-son duo was soon fielding calls from friends and family who wanted their help and fledgling expertise. They're new in the biz, but have designed and installed a handful of systems — some off-grid, like their own homes, and some so-called "net metering" systems that feed power to the existing electrical grid. The No. 1 source of solar jobs in Vermont is in installation, according to a 2013 report by the industry group the Solar Foundation. These are the boots-on-the-ground positions: preparing sites, putting panels in place and flipping the switch. Another father-son pair — master electrician and journeyman Arnie and Frank Braman — were also on site in Milton last week. After taking some solar courses at Vermont Technical College, they've paired up with the O'Mearas to handle some of the electrical work that goes along with solar installations. Getting up to speed to include solar installations in their portfolio wasn't overly complicated, said Arnie Braman. "It's still amps, watts and volts," he joked. The Bramans followed a shallow trench from the solar unit back toward the house, and Pat and Darren O'Meara set to work on the hydraulic unit that would soon top the mast. "What a day, huh?" said Pat O'Meara. Fittingly, the sun was shining. The scenario is easy to imagine: The electrical grid goes down because of a natural disaster, massive storm or terrorist attack. It could be days or weeks before power is back up and running for the average homeowner. But emergency workers such as doctors and police officers need a way to power their operations. That's where so-called "microgrids" come in. Figuring out the best way to manage microgrids is just one of the problems that Burlington's Smart Resource Labs is trying to solve. Founder AJ Rossman and a small team of energy professionals and software developers work at the intersection of IT and energy development. By way of example: Smart Resource Labs stepped in when a mobile medical clinic in South Carolina wanted to move beyond diesel fuel to power its rig. The first step was an energy audit, to find out how much energy the mobile rig used and where it was being wasted. That information was the backbone for designing a more renewable — and longer lasting — microgrid. "Especially after Irene," said Rossman, speaking of the tropical storm that hammered Vermont in 2011, "people are realizing that it really helps to be resilient." But it isn't enough to throw a solar panel on a roof. Data matters, and Rossman's team is looking for novel ways to help organizations collect and manage data from natural resources such as energy, water and soil. For instance, they've paired up with Housing Vermont, a nonprofit that manages more than 1,800 affordable rentals, to track energy usage across various properties. The idea is to aggregate, analyze and display data in a way that's useful and that can point to trends over time. Most companies are swamped with data, but don't have the time, resources or know-how to do that. "We're the bridge," said Rossman. Rossman is no stranger to solar. 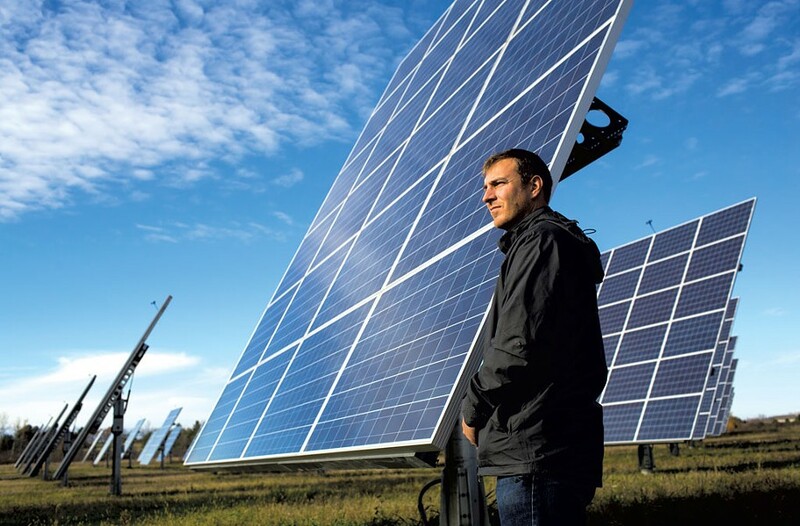 In 1999, he founded solar powerhouse Draker, which to date has installed systems at more than 1,600 solar sites that manage more than 1.2 gigawatts of energy production. He left the company three years ago and now works out of a North Street office in what was the first commercial solar-powered building in the city. Hanging over his desk is a photo of the first commercial solar array on which he worked, back in the early days of Draker. The 200-kilowatt project was located on one acre in northern California. "If you had told me that, in 10 years, there would be four or five sites in Vermont that are 10 times that size..." he said, trailing off with a laugh. He predicted his response would have been, "You had to be really deep in northern California to believe that." Vermont, he said, is a particularly good place to be these days for solar entrepreneurs, some of whom have made it to the national stage. Rossman's company and Middlebury-based Faraday were two of seven finalists in the Start-Up Alley competition at the Solar Power International conference earlier this fall. Faraday went on to place third in the competition. Rossman said that success speaks to the depth of the industry in Vermont. "There's this huge ecosystem that has a ton of experience," said Rossman. Stashed under Ian Ray's desk at Generator, Burlington's high-ceilinged, industrial-chic maker space, is an angular contraption that looks more like a child's Erector Set than a $20,000 business venture. Perched atop that same desk is another, slightly smaller contraption covered in multicolored electrical tape and topped by four helicopter-type blades. They're not toys but drones — or, more accurately, unmanned aerial vehicles. Ray's cubicle is home to AirShark, a two-man startup intended to put drones to work surveying, inspecting and photographing large solar installations. Ray is a photographer by training and a tinkerer at heart; he brought the drone expertise to the partnership. His cofounder, Jon Budreski, is licensed pilot who spent eight years selling solar panels through RGS Energy and SunCommon before striking out on his own with Ray. "If there's a panel that's failing, it's going to generate more heat," said Ray. With a thermal image, he said, "You'll see that well before you notice a physical problem." While Budreski and Ray focused on the solar industry first for their startup, it's just the tip of the iceberg for AirShark. Drones equipped with thermal sensors could perform energy audits of buildings — pinpointing the places where heat is escaping, for instance. They could inspect wind turbines and other industrial infrastructure, such as bridges or power lines, that can be difficult or hazardous to access. 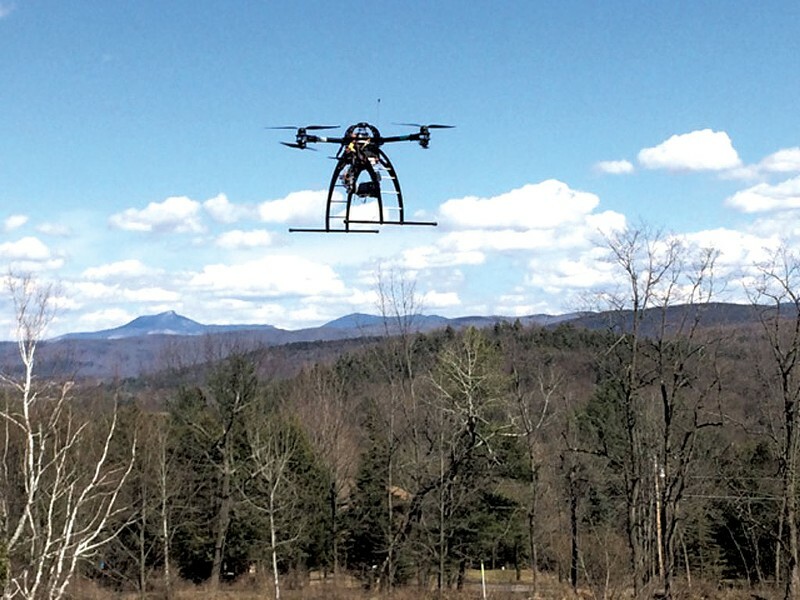 Ray and Budreski do face one major hurdle: The legal framework governing drones in the United States is "nebulous" at best, said Budreski. The Federal Aviation Administration was set to release regulations for drones by the end of next year — but the FAA has pushed back the release of new drone regs before and is running behind schedule this time, too. In the meantime, the pair is talking to would-be customers and focusing on developing software and engineering solutions — like the little gimbal Ray designed to house a GoPro camera and high-end thermal sensor on one of the drones. It was fabricated on the 3D printer at Generator. 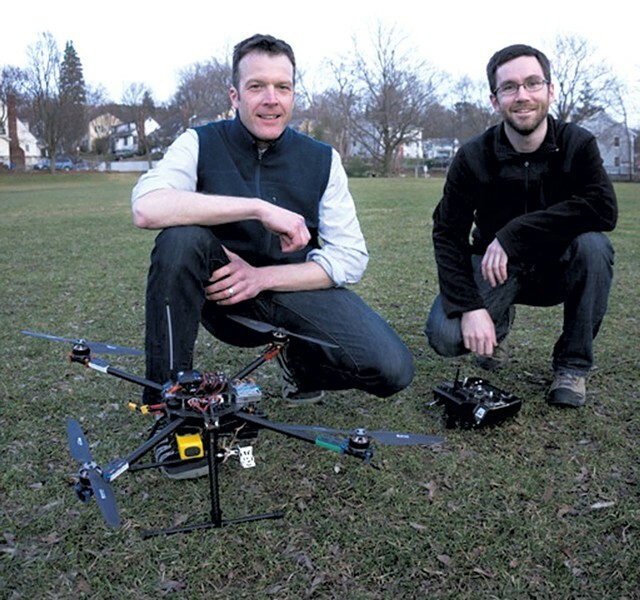 "It's a learned skill — like riding a bicycle or driving a car," said Ray of flying the drones. But as AirShark's makers think about industrial applications for the unmanned aerial vehicles, he said, the value won't come from the contraptions themselves. "At the end of the day, we're not going to be a drone company," said Ray. "We're going to be a software and data company. The value comes from the information." The trick is educating clients, many of whom are unfamiliar with a drone's capabilities, about what that information can be. It's a good problem to have, said Ray: "To be on the bleeding edge of something is a good place to be." The original print version of this article was headlined "Here Comes the Sun"